Mindray showcases its most recent product innovations on 71st China International Medical Equipment Fair (CMEF) in Shenzhen, China. 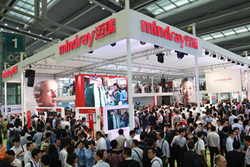 Mindray showcased its most recent product innovations on 71st China International Medical Equipment Fair (CMEF) in Shenzhen, China from April 17th–20th. This twice-yearly event is the largest exhibition of medical equipment and related products and services in the Asia-Pacific region. With its broad appeal across a range of medical disciplines and therapeutic areas, CMEF presented a perfect opportunity to put Mindray’s new ‘medical minds think alike’ campaign into action – providing a forum for both listening to the needs of clinicians, researchers and payers and explaining the specific benefits of Mindray’s range of integrated medical device systems for their hospitals and institutions. Mindray’s stand was popular with visitors who were interested to find out about its range of leading edge technologies. CAL-8000, launched in November 2013 and on show at CMEF for the first time, typifies Mindray’s integrated approach. The exceptional performance of the CAL-8000 is achieved by combining fully automated instruments with a proven track record in clinical laboratory analysis (the BC-6800 haematology analyser and the SC-120 slide maker and stainer) in one powerful workstation. Another product making its debut at CMEF was the M9 portable ultrasound system. The M9 demonstrates that sonographers no longer need to sacrifice performance for portability. Despite its compact size, the M9 boasts technologies such as Echo-Boost, LVO with Stress Echocardiograpy, TTQA, UWN with contrast imaging and natural touch elastography, making it an ideal shared-service solution for use within multiple clinical settings. Portability also defines the new BeneView TDS (T1 docking system). This system can be used wirelessly with patients being transported in emergency vehicles, stays with the patient in the ER and can be transferred with the patient to theatre and/or the intensive care suite. The T1’s specifically designed handle makes it easily portable while the patient is on the move. The availability of a dockable handheld monitor in addition to a full size static screen means that the patient’s vital signs can be monitored ‘on the go’ as well as at the bedside. In addition, the TDS Docking Station can connect a 19'' touchscreen which provides the same intuitive BeneView user interface.